I know that I’m not alone in saying that one of my favorite parts about baseball is the projection of young players. In fact, I’d probably even say that I enjoy dreaming on what young players could be even more than I enjoy players for what they actually are. It’s one of the reasons I follow the Cubs and Twins (get well soon, Byron) farm systems as closely as I do the A’s and Dodgers big-league clubs. Obviously, it’s especially exciting when a group of young prospects on the same team all come up and meet expectations, as rare as that may be. To take it one step further, it’s just the best when all of that talent is concentrated in one positional group (pitchers, infielders, outfielders). So in an effort to combine my love of projection with what is currently happening on the field, I’m going to take a look at a couple of the most exciting young units in baseball. Of the top ten, only two teams are currently starting an outfield where all three players are 28 years old or younger. Now, it would be pretty funny if I said they were the Orioles and Blue Jays just to make you angry, but since you’re a person who ostensibly reads titles before you read articles, you know that these two teams are the Pittsburgh Pirates and Miami Marlins. Spoiler revealed. Anyways, both young outfields are clearly extraordinarily talented. Each unit has an excellent case as the most promising outfield for the next five or ten years. That said, it’ll almost surely be a young outfield that exceeds them, because if baseball does nothing else, it destroys our expectations each and every season. But focusing on the task at hand, the two outfields are very similar if you look at them in a certain arbitrary way. They each feature one superstar (Andrew McCutchen and Giancarlo Stanton), a strikeout-prone “tools” guy (Starling Marte and Marcell Ozuna) and a skinny corner guy with all-star potential (Gregory Polanco and Christian Yelich). Now, those descriptions don’t really matter, but they’re interesting nonetheless. What does matter, however, is performance on the field. The Pirates outfield has probably been the more hyped unit so far, and I think the majority of people would choose them to be better going forward as well. 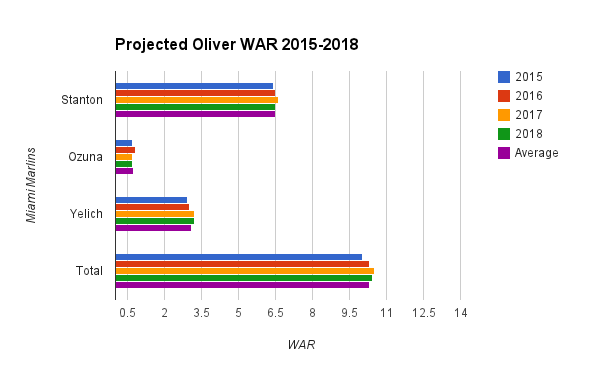 Their core three is currently the more productive, and they blow away the Marlins in production over the next four years, using the Oliver projection system. 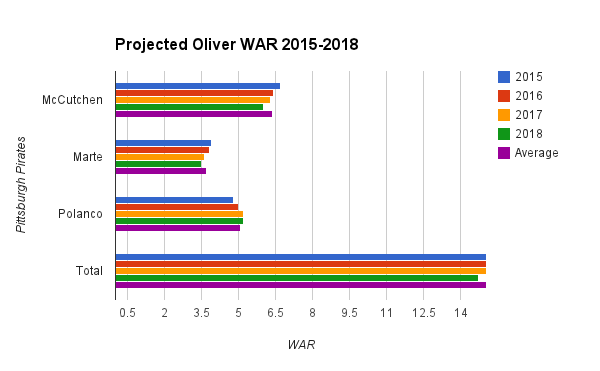 If the projections turn out to be correct, the Pirates outfield is going to be, on average, 4.8 wins per season more valuable than the Marlins. But I have a couple of issues with these projections. First, wow do they hate Marcell Ozuna. This is somewhat understandable considering Ozuna never was that highly regarded as a prospect, and some people thought that the Marlins were making a mistake by promoting him to the big leagues so quickly last year. But as he’s shown since his call-up, Ozuna is actually pretty valuable. In only 70 games in 2013, he was worth 1.6 fWAR. In 2014, he’s been hitting for power and been worth nearly 2 wins with a month and a half left to go in the season. He’s not a perfect player (28.7 K%), but I think it’s fair to say that he’s not the borderline replacement-level guy that he is projected to be right now. My second issue is that I just can’t get comfortable projecting Gregory Polanco as a 5 fWAR player just yet. He’s obviously a top prospect holding his own in the majors, but five-win players are really good. Only 19 position players were more valuable in 2013 than the 5.2 fWAR that Polanco is currently projected to reach by 2018. I certainly won’t be shocked if he reaches that level, but man, as fun as prospects are, sometimes they bust for no apparent reason. I’ll need to see a full productive season before I feel good about calling him a future MVP vote-getter. Unfortunately for the Pirates’ case in this argument, the outfield fWAR top ten that I posted at the beginning of the article largely reflects the contributions of a player whom I have not mentioned thus far: Josh Harrison. At just 27 years old himself, Harrison has continued to be productive after what most assumed was just a hot couple of months. However, with Polanco now in the majors, it looks as though Harrison will be playing in the Pirates infield over the coming years, assuming all of the outfielders are able to retain their health. So it will likely be up to Polanco to replicate Harrison’s 2014 numbers (144 wRC+) going forward, a tall task even for someone as talented as he. Combine that with the possibility that Andrew McCutchen begins to decline upon hitting 30 in a couple years, and the Pirates outfield may not look quite as pretty as it does on paper at the moment (though it’ll still probably be really good). Now, rather than continue to list reasons why you shouldn’t choose the Pirates, let’s talk about one final reason why you should choose the Marlins in our completely meaningless debate. Talent aside, the Marlins’ greatest advantage over the Pirates is their youth. Stanton is actually the oldest of Miami’s outfielders at the decrepit age of 24, while Ozuna and Yelich are 23 and 22, respectively. As a group, they certainly have the longest way to go to reach their ceiling, but they also have the most time to get there. And if you’re like me, you may be inclined to be on upside. When choosing between these two outfields, there’s really no wrong option, as cliche as that may sound. They each have a combination of current production and future projection that we simply don’t see very often. Personally, despite all of the reasons I listed against them, I’m still inclined to go with Pittsburgh, but the choice is harder now than it was when I began this post. Either way, it doesn’t really matter. We’ll be able to sit back and enjoy both units, hopefully for the next decade or so. This article was originally posted on gappower.wordpress.com, a site you’ve definitely never been to. I’ve checked. You can also find me on Twitter, at least occasionally. Coming into the year, the Boston Red Sox were riding high after the 2013 title in which they’d gone from worst to first. Just about everyone with a worthwhile opinion thought that’d they at least be in contention for the playoffs again this year, and it wasn’t uncommon to see people picking them to repeat in 2014. One of the few questions people did have about the team was how would they integrate their two young players, Jackie Bradley, Jr. and Xander Bogaerts, in their first full seasons as starters. Of these two players, Bradley was the one that people seemed most concerned about. This made sense, since he was less regarded as a prospect than Bogaerts (number 2 overall on most prospect top 100 lists). But while Bradley has been a complete zero with the stick (57 wRC+), his defense has carried him to 1.5 fWAR so far this season. Bogaerts, on the other hand, has a wRC+ of 82, which combined with mediocre defense has left him hovering around replacement level. Now, there’s no doubt that people are disappointed by Bogaerts’ season, and they have every right to be. Bogaerts was hyped as the rare prospect with superior skills and a significant amount of polish, and he showed why when he played like a veteran down the stretch in last year’s playoffs. Nobody was expecting him to be replicate Mike Trout’s rookie season, but a league average regular was probably a reasonable expectation. Obviously Bogaerts has underperformed relative to that standard. Guys like Trout, Yasiel Puig and Manny Machado have essentially ruined the kind of expectations we now put on guys going through their first full seasons. Do you know how many batting-title-qualified rookies have had an OPS lower than Bogaerts’ current .650? 311! And of that 311, 283 of them were older than Bogaerts’ current 21 years of age. Bogaerts is struggling, but that’s what rookies do. There’s no greater jump in professional baseball than the one to the majors. 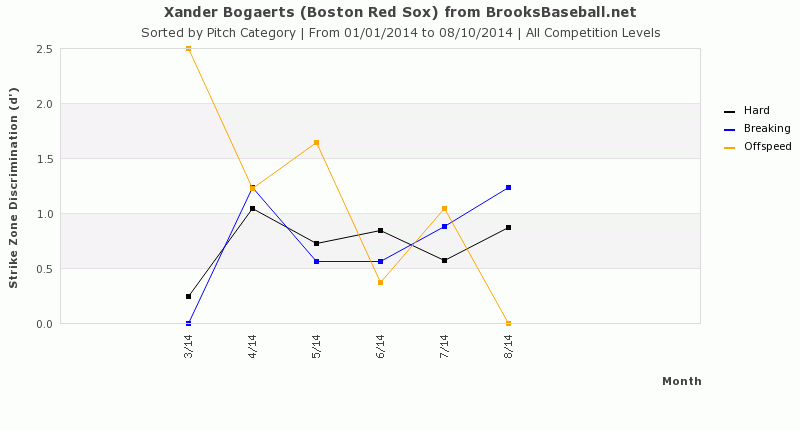 Bogaerts is actually hitting pretty well against fastballs and changeups. The crux of his issues this year have been against breaking balls. And there’s really no way to sugarcoat it. He’s been terrible against any and all spin, hitting just .143 and slugging .167. Unfortunately, opposing pitchers have noticed, and Bogaerts has only seen more breaking balls as the season has progressed. 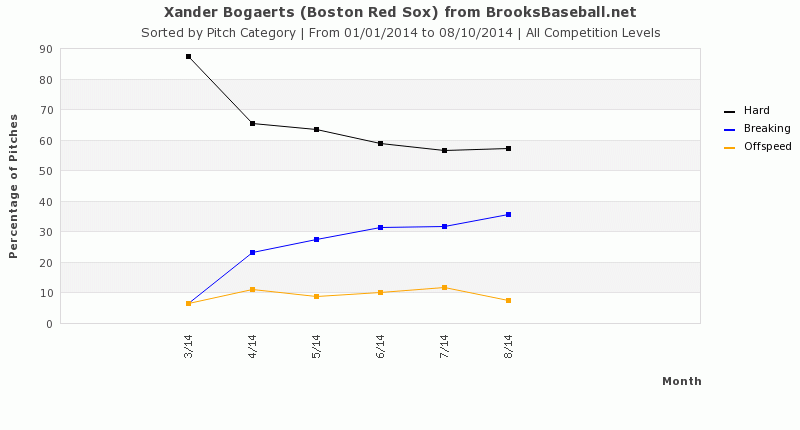 As the rate of breaking balls has gone up against Bogaerts, his numbers have gone down. The Red Sox shortstop was actually a well above average hitter heading into June (119 wRC+ in March/April, 149 wRC+ in May), but then everything fell apart. Bogaerts posted an almost unthinkable .426 OPS in June, a number less than half (.897) of what he posted the month before. He followed that up with a much improved, but still terrible July (.595 OPS) and continued to struggle in August. Bogaerts’ struggles with breaking balls coincide with the part of his game that has perhaps regressed the most as his season has progressed: his plate discipline. After working 25 walks through the end of May, Bogaerts has been told to take his base just seven times since. A large part of that has been the decline of his ability to discriminate between a breaking ball thrown for a strike, and one thrown for a ball. As you can see in the graph above, Bogaerts has stayed fairly steady against fastballs and changeups, but his ability to recognize breaking balls has completely melted away. As for why this has happened, that’s difficult to say. Maybe Bogaerts has always struggled against breaking pitches. But the most likely answer is that he’s a rookie struggling to adjust against pitchers capable of taking advantage of his weaknesses. Nevertheless, it’s at least been a prolonged slump, and one that Red Sox fans have to hope isn’t a glimpse into continual struggles for their youngest player. Then, putting aside things that we can actually measure, there’s the possibility that Bogaerts is simply in his own head right now. As a ballplayer, he’d probably tell you he’s trying to do too much. There’s certainly something to that side of the argument. It can’t be easy to fail so spectacularly after being hyped as the next face of one of the most prestigious franchises in the game. There’s also an argument to be made that some responsibility for Bogaerts’ struggles can be set at the feet of his manager, John Ferrell. There have been rumors that Ferrell was the person in the organization pushing the hardest for the Red Sox to resign Drew, which they ultimately did in late May. Drew, who had never played any position but shortstop in his big league career at that time, would be forcing Bogaerts over to third base, the position he played down the stretch of the 2013 title run. Bogaerts expressed some disappointment at time as a result, and an argument can be made that the team’s decision to resign Drew shook his confidence. Before Drew joined the lineup on June 2nd, Bogaerts was batting .296/.389/.427. Since then he’s hit .169/.201/.279. You might say that those dates are arbitrary and coincidental, and you can make of them as you wish. I will say that confidence is a huge part of succeeding in this game, and it should not be overlooked. Overall, Bogaerts probably won’t look like he belongs back in AA forever, though we may have to wait until 2015 to see the player we were all hoping for. We got that player in the first couple months of this season, but pitchers’ adjustments, along with Bogaerts lack of adjustment to those adjustments, have torpedoed what was initially a very promising rookie year. That said, young players with Bogaerts pedigree and polish often turn into solid players at the very least, and I’m still as excited as ever about his career going forward. He’ll figure it out.